Oddfellow's Orphanage by Emily Winfield Martin. Review: Oddfellow's Orphanage is a charming, whimsical book for ages 4 to 8 and 20 to 100. The main character is Delia, a newly acquired orphan to very unusual orphanage. This surprisingly happy book is written by Emily Winfield Martin and published by Random House Children's Books. Oddfellow's Orphanage follows Delia on her adventures at her new orphanage. Oddfellow's Orphanage is not your typical orphanage and the orphans are unique too. Delia is fascinated to meet her fellow orphans who include a boy with an onion head, a girl with tattoos, and a hedgehog. There is even a family of dancing bears that lives there, too! Delia herself doesn't speak but is given a notebook she wears on a string around her neck to communicate. While at the orphanage, the children receive an unusual education taking classes like fairytale studies and cryptozoology. Along with her new friends, Delia goes to places such as an amazing circus and on adventures like exciting monster hunting. They also celebrate the holidays together like Christmas and New Year's Eve. Every chapter shows them growing as individuals and also as a newly formed "family." I absolutely loved this book. On a scale of one to five, I would give it a five. The illustrations included in this book are beautiful. I also liked how every chapter started by explaining one person in the orphanage until you learned the backstory of every character. During each chapter, there is some kind of adventure or mystery like in one chapter when Ollie, the onion head boy, thinks he might join the circus and leave his friends. This mystery and others like it kept me addicted to the story which I liked. My only problem with the story is that it isn't longer! A story about a group of orphans could easily be sad, and I was pleased that this story was such a happy one. Even though the children have lost their own families, they have found a new family with each other. We would like to thank Random House for providing a copy of Oddfellow's Orphanage for this review. 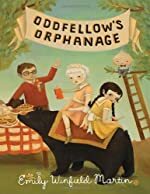 Have you read Oddfellow's Orphanage? How would you rate it?